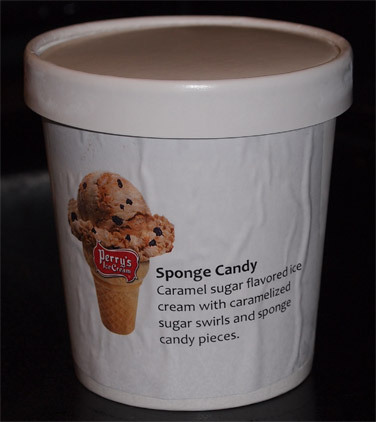 [Scoop shops in 2013, Pints in 2015] Ok, my last Perry's Ice Cream review didn't go as well as I hoped, but maybe this one is going to provide the caramel kick I was so looking for in Movie Time. You see, Perry's Sponge Candy Ice Cream is the kind of crazy flavor that could be epic.... or send me into sugar shock, but hey, I'm tough, I'll go first, no worries. 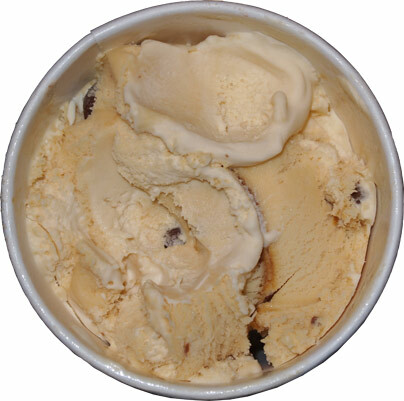 We've got caramel sugar flavored ice cream with caramelized sugar swirl and sponge candy pieces. Have you ever heard of such a thing? I haven't, and that just gets me all the more excited. Wow, it certainly smells "caramelized", or as the rest of us call it, burnt. Kind of smells like someone let the hazelnut coffee on the burner just a wee bit too long. I guess they're weren't messing around when trying to go for that authentic taste. So what if I don't know exactly what sponge candy is? It's chocolate coated sugar of some sort, what else matters? Hehehe. Sure looks cool doesn't it? I ate the samples after taking this picture and it's a sweet crunchy bit (kind of like a rice crispy) surrounded by a thick milk chocolate coating. They do vary in size a bit. I take my first bite and, hmmm, that's different. It almost tastes carbonated. You could tell me this is cream soda ice cream and I would believe you. I'm digging right into the heart of this swirl and I still don't know what to make of it. It's a really strong burnt flavor, almost like some kind of caramel brittle... yup, talking in circles I am. This is one of those flavor descriptions you read but it doesn't really sink in. It says caramel sugar, so technically I should have thought brittle flavor, but instead I start thinking of a really sweet caramel. I was wrong, it happens, that's why we're all here. This one is unique, I'll give it that. I feel like I should be sharing this with my grandparents in a soda shop. Part of me says I don't like it, but the other part of me is going "dude, this is just funky". It's the kind of flavor you try to share so people can say "whoa, yeah, that's different alright". 2015 Update: This became an escapes pint flavor this year! That "burnt" flavor is natural to sponge candy. (It's made by cooking a sugar syrup with a small amount of vinegar I it to the hard crack stage, then adding baking soda to make it puff up. The baking soda is responsible for the "burnt" flavor, especially if it is not mixed in well, and it also gives the candy a carbonated taste. If sponge candy isn't something you already know and love, it probably would taste weird to have it captured in ice cream. I've never seen or tasted this ice cream flavor, but from your description it sounds like they captured the flavor of sponge candy dead on. thanks for the background! if i see some sponge candy, i definitely need to try it.